The U.S. market will be celebrating World Land Rover Day at its new 12 acre headquarter campus in Mahwah, New Jersey with a gathering of people and products of historical significance for the brand in North America. Members of the winning 1993 American Camel Trophy U.S. team will be reunited with vehicles that competed in the rally that year in Malaysia. The company will also have an original 1987 North American Spec (NAS) Range Rover Classic from the first year Range Rover was sold in America, and several examples of the NAS Defender sold in America from 1992 to 1997. 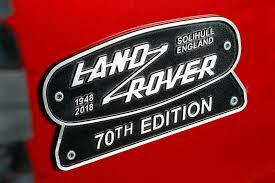 The day will be capped off with an award ceremony for the new Land Rover Discovery from Four Wheeler magazine. The fifth generation Discovery was recently honored by the magazine as its Four Wheeler of the Year for 2018, continuing a tradition of off-road leadership for which the Land Rover brand was built on 70 years ago. While 2018 marks the 70th anniversary for Land Rover globally, the U.S. market celebrated the brand’s 30th anniversary in America in 2017 with record annual sales of 74,739 units, buoyed with the addition of the all-new Land Rover Discovery and Range Rover Velar to the brand’s product portfolio.